The southernmost site in the U.S. National Park System isn’t in Texas or Florida or Hawaii—it’s in a whole other hemisphere. Can you name the one U.S. national park site below the equator? National Park of American Samoa. camera icon Photo © Ben Sander/NPCA. A: Coral reefs, cloud forests, tropical flowers, crystal-clear ocean waters, and exotic wildlife: Throughout all of America’s public lands, there is nowhere quite like the South Pacific paradise known as the National Park of American Samoa. This spectacular landscape—and seascape—includes sections of three volcanic islands, and is located roughly 2,600 miles southwest of Hawaii, between Fiji and Tahiti. This unique place is the only U.S. national park in the southern hemisphere. Though the park covers just 76 square miles, the lush rainforests above ground and the pristine waters surrounding the islands provide habitat for a diverse array of tropical wildlife, including fruit bats, whales, rare birds, more than 250 types of coral, and nearly a thousand different fish species. It’s an ideal place to swim, snorkel, hike, and relax on secluded beaches. 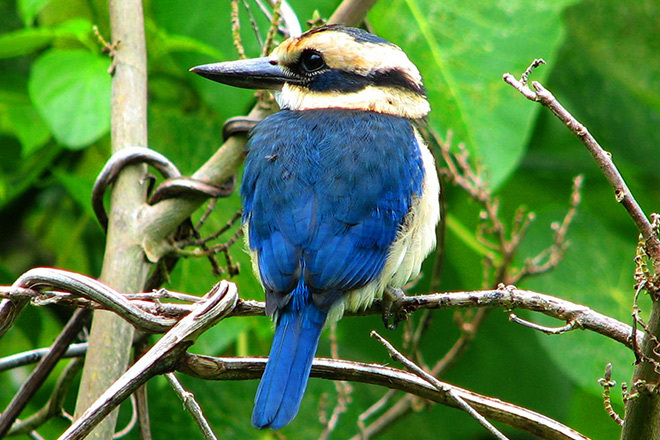 A collared kingfisher at the National Park of American Samoa. National Park Service photo. A visit to this park is also an opportunity to learn more about the Samoan culture. Approximately 70,000 people live in villages throughout the archipelago, keeping their traditions as the oldest civilization in Polynesia alive. The park offers a homestay program in which visitors can stay with families in nearby villages and participate in traditional meals and activities. Established in 1988, this relatively new park has few visitor services—adventurous travelers should plan ahead, carefully heed safety warnings and cultural customs, and consider hiring guides in advance to explore the area’s trails and beaches. NPCA also offers a guided trip to this unique and exotic park, though spaces fill quickly and departures for 2015 are currently full. If a trip is on your wish list, it’s worth the extra effort to experience this singular island vacation on American soil.